The dogs live in the house with us as companions and take turns in coming to work with me.àµ°pies are reared indoors with us and live as part of our extended family. Tracy Morgan, Animal Photography Tel: 01494 883176; Steve Jefford, K9Photos.co.uk and Nick Ridley, (www.nickridley.com) - their work is Copyright and may not be reproduced without their written consent. 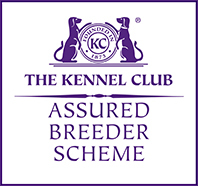 I am a member of the Kennel Club's Assured Breeder Scheme. You can find out all about this scheme by following the link above.